Hello and welcome to the new academic year 2018-2019! We begin our spelling journey with using our brand new spelling resource called Spelling Shed. Each child will have their very own individual log in and can compete for points to earn a certificate and wrist band. Please see you class teacher if you require any help or if you need a replacement log in. Every Monday after collective worship, we will celebrate spellings as a whole school and give out certificates and trophies for the most points scored. Top individual spellers in whole school! Our KS1 winning class this week was 1JR, just beating 2RH. Our KS2 winning class were 5HC, narrowly beating 3LK for the coveted trophy. Individual winners this week were; in joint 3rd place with 3,000 points Pieter and Jack B, in second place with 4,400 points was Jude and in 1st place with 5,100 points was Henley. We have launched Spellodrome in school this term to help the children get even better at spelling and improve their writing. Our individual winner this week is Jay Mc with 2,315 points. In second place we have Brad Mc with 1,940 points. 3rd place is Noah Philip with 1,780 points. Our KS1 winning class is 1LN and our KS2 winning class is 4BW. Well done to all our winners this week. Individual winner this week is Marc Lacey - well done Marc!! Well done to our winning Spellodromers this week! Sophie O'B Scored 3,050 points. Our winning classes this week are 2ED and 5HC. Individually, our winners are Ben Illingworth with 6,000 points, Connor Kilvington with 4,210 points and Jay McManus with 2,850 points. Well done to all our winners! Our winning high scorers this week have all come from 1 class - 3LK. A massive 'well done' to Connor with 6,470 points, Jack with 6,335 points and Naomi with 4,580 points. 3LK for key stage 2 and 2ED for key stage 1. Our winning Spellodromers this week are Evie D with 11,535 points, Molly with 10,070 points and Connor K with 10,000 points. Class winners this week are 2ED for KS1 and 5CC for KS2. Class winners this week - 1JR are our KS1 winners, and 5HC are our KS2 winners. Our winning individuals this week are Scarlett with 3670 points, Chantelle with 3815 points and Lotta with 3950 points. Well done to the girls - come on boys, can you match the girls next week? Spellodrome is now proving more and more popular with our younger children! For our class trophy we have in third place 4CG, second place 1JR and a massive 'well done' to our winners this week - 2RH. With a score of 50,000 points, Molly Thirkell from 4BW is our outstanding winner this week!! Will this score ever be matched? Our winning class this week is 5HC, closely followed by 6VH with 2RH just behind them. Well done to Ellis this week for his amazing score of 8,350 points which means he is our winning Spellodromer! The class with the highest percentage of users is 5HC with an amazing 100%. Super spelling year 5! 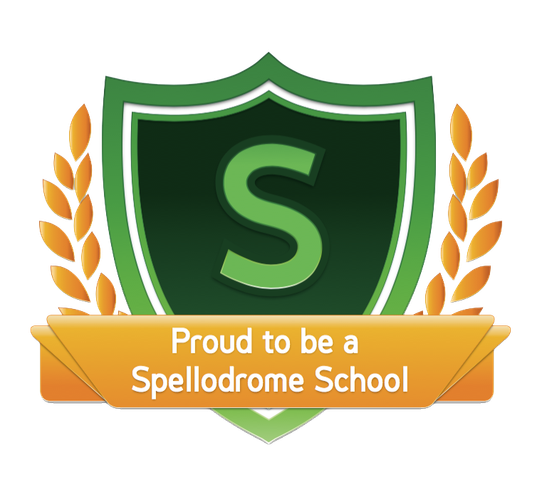 For the first time this year, we have more Spellodrome certificates than Mathletics... and we've not even started our after school and lunchtime Spellodrome clubs yet. Our winning class this week is 5HC with 55.5% of the children in the class working on Spellodrome. Closely behind 5HC is 2RH with 55.19%. Our top student with an unbelievable score of 23,070 points is Molly Thirkell. Her nearest rival is James with 1,705 points. Well done Molly and well done 5HC. This page will be updated on a weekly basis to celebrate success...Keep checking! Spellodrome is part of the Mathletics website. It marks answers as soon as they are submitted, and can give your child help if they get stuck when they click on the question mark. In Live Spellodrome, the children can enter races against other children in their class, school or across the whole world. Parents, to find out more about Spellodrome click here. Also as part of Spellodrome is 'Writing Fun'. 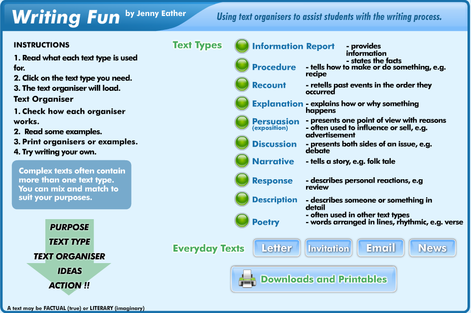 It helps the children to identify the elements in different types of text, with examples of expectations for each year group.